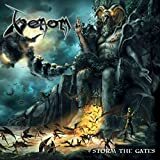 The mighty Venom are back on Friday, December 14th with Storm the Gates through Spinefarm Records. 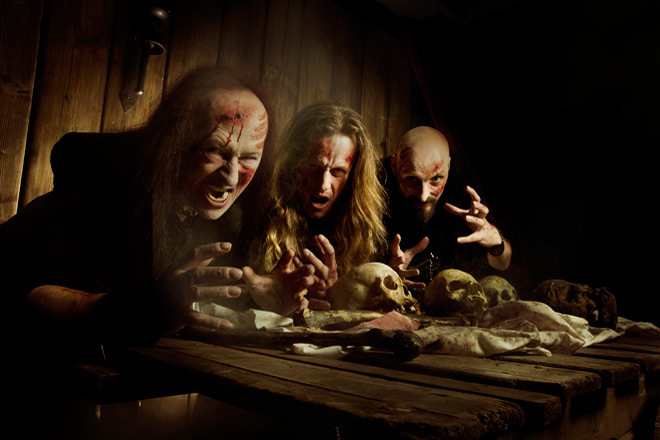 On the heels of 2011’s Fallen Angels and 2015’s From the Very Depths, Storm the Gates marks the tenth anniversary of the current lineup, with the immutable Conrad “Cronos” Lant on bass and vocals, flanked ably by Stuart “La Rage” Dixon on lead guitar and Danny “Dante” Needham on drums. Furthermore, Storm the Gates is also the first released under the legendary Venom banner since their evil twin, Venom Inc, was formed by founding members Jeff “Mantas” Dunn on guitar and Anthony “Abaddon” Bray on drums, with one-time Cronos replacement Tony “Demolition Man” Dolan handling bass and vocals. So what do the original Black Metal kings have to offer? The raspy voice of Cronos still chills the spine, decades after Welcome to Hell, but sentiment only goes so far. Based on interviews and other publicity material, the band wants to be taken seriously on its own merits while still performing under the historic Venom herald. Storm the Gates has a purposeful lo-fi feel to its songwriting and progressions, but the impeccably clear guitar solos quickly break the nostalgic fog. The tracks here alternate between all manner of genres, from near-crust punk, to almost Progressive Metal, to the darker beginnings of what eventually became Black and Death Metal; often, these shifts are encapsulated within individual songs. A fast, rollicking track, “Dark Night (Of the Soul)” also illustrates this double-edged sword of the modern Venom lineup: the presence of Cronos is what makes this band officially Venom, but he is also weakest leak in the proceedings. He may still handle songwriting and production, but his work on bass and vocals is meddling at best (and his songwriting is not particularly strong, either). “The Mighty Have Fallen” is trapped in this same pattern, with more guitar stylings from Rage locked within an otherwise pedestrian battle march. Moving forward, “I Dark Lord” makes use of awkward distortion; the sound here may have intended to add foreboding, but instead it sounds, at best, meandering and washed out, and at worst, a decade-late attempt to capture the subtle aggression of almost Nu Metal. As with most tracks, there is an impressive guitar lead from Stuart (“La Rage”) Dixon, but overall this track is a muddy mess. Later, “Beaten to a Pulp” is squeezed between the typical call-and-response Punk aesthetic and a slow, devolving dirge that includes some impressive solo work from Rage, before returning to the quicker pace. The following track, “Destroyer,” is a basically mirror image, with its title easily chanted over a slow, remorseful pace that quickens only for the guitar solo work; the result is one of the stronger tracks on the album. “We the Loud” later mixes the strength of a galloping start with a slow, head-banging crescendo. At its tumultuous start, Venom was the band that willingly sacrificed skill for the sake of sheer speed; nearly forty years later, it is hard to mimic that ethos today, as the mere passing of time means that capable musicianship and songwriting prowess have caught up with the band. Also working against the band is perhaps the trail they helped clear: references to Satan, the occult, and other “dark” entities are almost commonplace, and as such there are portions of Storm the Gates, such as the lyrics to “Immortal,” where these these references, particularly using 1980s vernacular, sound almost whimsical. Luckily, the guitar solos pepper throughout the album do their part to help cleanse the listener’s palate of any goofy eeriness. The trio is more than adept at playing tribute to the back catalog during live appearances, and while Storm the Gates adds half its weight in strong songs, the other half is largely made up of forgettable filler. Oddly enough, the weaker songs seem stacked earlier in the track listing, with some of the stronger songs bring up the last of the baker’s dozen, so those who are not put off by early tracks will hear a reward. That in mind, there is a monster thirty-minute album tucked in the fifty-plus of Storm the Gates, but the filler is almost enough to drown the effectiveness. That is why Cryptic Rock gives Storm the Gates 3 out of 5 stars.